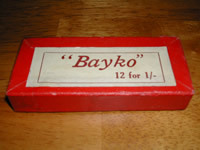 Not too surprisingly, comparatively little pre-war BAYKO packaging has survived, so, much has to be deduced from comparatively little. However, there is no such shortage either in the post-war period, or the MECCANO era. 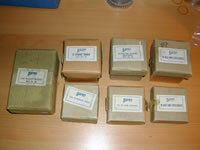 Pre-war BAYKO Spare Parts Price Lists priced all their spare parts in fixed quantities, e.g. twelve Red or White Bricks for a given price. 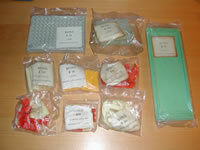 A few boxed examples of most of the Spare Parts concerned, with quantities which match these listings, and even have matching prices printed on them, have survived so it is reasonable to assume that parts were actually intended to be sold in these boxes. That, perhaps is an argument that this should count as Retail Packaging, certainly the presentation standard was good enough, but I suspect that in reality more flexibility was the norm. …similarly for Canopies, Chimneys, Platforms and Steps. I also have a photo-copy of an early pre-war Retail Display Cabinet Contents List which details all the box quantities referred to above, and more. Just one slight word of caution - some boxes, like those for Pillars, could easily hold at least twelve parts, but the box still says “6 for 1/-” [5p], so this seems to be an intermediate example. This may raise a slight question mark, however, I still think that the printed list is our best bet. 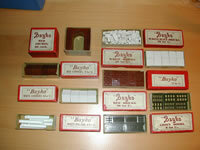 Click here to see more on this printed list of BAYKO's pre-war spare parts box contents. …and I'm sure that this box format was certainly used right up to the war, including the provision of new boxes for 'New Series' parts [left]. 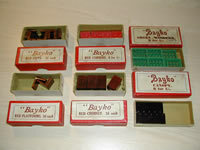 The box [above, left] has no part name but bears the script “12 for 1/-” [5p], the price for Curved, End and Long Bricks as shown in the final pre-war BAYKO manual, a price point never used at any other time. The focus here is clear, the retailers struggle with packs missing labels lost out..
…to the packaging cost savings benefits they made possible, for Plimpton. Please click here to email me if you know! Click here for further information on the range of Logos used by BAYKO. The pre-war Rod boxes shown in the picture [right] show that the same approach was used to supply Rods as well, intuitively I believe this to have been the case from the start. I doubt if even the most optimistic of retailers ever expected to sell full Rod boxes to the pocket money brigade, so there use as a wholesale storage unit seems clear! This approach, in slightly different guises, prevailed through most of the life of the BAYKO product. However, Retail Cabinets are usually found with Rods held only with rubber bands, alongside substantial stocks of loose conventional plastic parts so…? 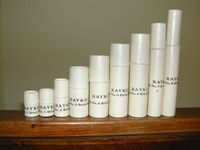 BAYKO spares were generally sold from wooden or cardboard Retail Cabinets, which were designed to be located on the shop counter. Click here for more information on Retail Cabinets. Click here for more information on Retail Cabinet Contents. Retailers topped up their stock of BAYKO spare parts [in this case definitely also including Base Links and Screws] by ordering replacements, in fixed quantities, from Plimpton. These, for much, if not all, of the post-war Plimpton era, took the form of simple cardboard boxes [left], holding a moderate number [much larger quantities than pre-war] of one particular part. Quality, clearly, not being a key criterion here, there are several types of these [mainly] little boxes, usually made from thick grey cardboard, but occasionally from straw board. They are also frequently covered in paper - which I'm surprised wasn't seen as a cost step too far. There can, however, be no doubt that these boxed quantities were expected to be split to serve the young consumers - like your illustrious webmaster! Larger parts, such as the various roofs and bases were still ordered in prescribed quantities and wrapped to survive the journey [slide show - left below]. Written complaint must be made to the Carriers and the Senders immediately, otherwise no claim can be entertained. My apologies if you thought the underlined words above were links - they are not, they are as per the original. Post-war, Rods were still shipped in purpose-made tubes of the right length, designed as a very tight fit - personally, I'd have hated that packing job! 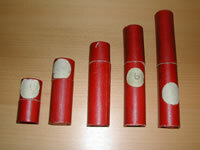 The tubes used for the Rods were predominately red [below right], however, as the image [further below right] shows, they also existed in white. I don't know why, but, for some reason, the small white tubes seem to have survived much more frequently than their larger brethren. I have only come across such Plimpton era Rod tubes, in either colour, for sizes up to 8-Brick Rods, which were the standard sizes in post-war sets. Pre-war, longer Rod boxes almost certainly existed, though I have none to show you. Remember set #6 included 10-Brick Rods. Post-war, Plimpton certainly advertised up to 12-Brick Rods, on their parts price lists, through to the early 1950s, which is certainly strong evidence that they probably existed, at least at that stage. However, I am a little more sceptical as to whether or not they did from the mid 1950s onwards - though both Plimpton and MECCANO would still have needed something to ship the longer Rods which were always available direct from them. …presumably the reason I've never seen any other larger Rod tubes is that they were never a standard stock item as far as Retail Cabinet contents were concerned. 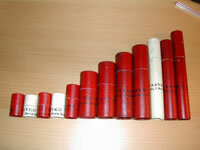 …the limited number of pre-war Rod tubes I've come across so far are the same. For the next item, while I'm afraid I've found nothing Floor related from the pre-war period, there are plenty of surviving post-war examples of the paper Envelopes which were used to pass Floors to, and facilitate Floor storage for, BAYKO retailers, the latter presumably in their Retail Display Cabinets. The spots are what the antiques trade, particularly the book trade, call 'Foxing', which is basically the effect of mould and/or acidity which discolours the paper. Given that the spot pattern reflects the pattern of holes in the Floors within, where air was freely available on both sides of the paper, this seems plausible. The second Envelope [above, right] was the Universal Envelope, used without regard to the Floor size. I believe these were used within BAYKO sets, and, perhaps, also for specific shipments direct to customers, so may not belong here - but I can't be absolutely certain, hence their inclusion here. This next item is unusual when you consider the state of the business at the time - which was, almost certainly, quite close to the MECCANO takeover, in 1959, or thereabouts. This is based, at least partially, on the frequency with which these items emerge. The images here [below right & below left] show BAYKO's whole experiment [?] with the [then] latest packaging technology - as far as I'm aware, anyway. As a former Packing Manager with KELLOGGS, I know a bit about this sort of machinery, and am surprised at this approach. The use of printed labelling on the film required a print registration control system, to ensure you always got a full label rather than two halves! I would suggest that this was both expensive and unnecessary. ...even if, by magic[!] the components dropped perfectly! This innovation must have been about product presentation, though I'm sure it also sent a massive shudder through the global elastic band market!!! Comparatively few of these bags have survived, so, for those who collect such things, they have a scarcity value. Not long before the MECCANO take-over, Plimpton launched a new part - Garage Doors. I don't know if the method they used for distributing them was the normal one, but you may find it of interest. Click here for more info on the Garage Door Launch. The MECCANO takeover brought with it a much greater degree of automation to the BAYKO spare parts packing process. Based on my observations, the free-flowing parts, such as Bricks, were always packaged in relatively small polythene bags, with an appropriate label. The quantities per bag suggest that these were probably intended to be sold as full bags, though, as before, doubtless many retailers would happily split them. Rather oddly, given the difficulty I would expect in handling them, all roof sections were sold in bagged pairs. Products more prone to interlock with each other, like Windows, were packed, probably still by hand, in yellow cardboard boxes [right]. Rather oddly, the fragile French Windows were bagged, yet the more robust Garage Doors were boxed. …though I feel certain that items like Arches and Garage Doors, which were packed in sixes, would, assuming common sense prevailed, have been split. 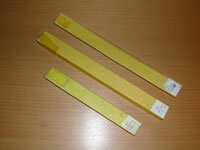 …Shorter Rods were packed in polythene bags [right]. MECCANO era cardboard Rod boxes were all made from comparatively thin yellow card, sealed with a modest white label, with blue typing, at one end, and cellotape at the other. 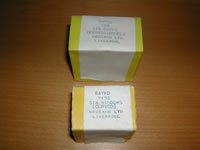 The polythene bags were heat sealed and included an easily visible, simple printed label, in exactly the same way as the plastic parts. Whatever the Rod packaging style, by comparison with the earlier, Plimpton era, MECCANO era Rods were packed in significantly more modest quantities [12s compared with 72s and 144s], therefore, I think we can reasonably conclude that both the bags [for the smaller Rod lengths] and the slim, rectangular-cross-section tubes [left] would normally have been sold intact. …click here for more information on Packing Anomalies.